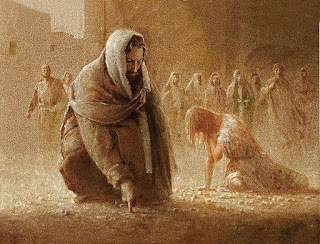 that the bones which thou hast broken may rejoice." Bryan Stevenson references this familiar story toward the end of his chilling and compelling book, Just Mercy. In the Gospel of John, however, when Jesus says this, the accusers “went away, one by one.” Recognizing their shared brokenness, no one could throw that first stone. In the United States we have a long history of people, acting in the name of the people, as agents of the state, who have thrown the first stone, last stone, or one of the middle stones to put someone to death. Capital punishment. A hundred years ago, the death penalty was actually falling out of favor. From 1907 to 1917, six states abolished the death penalty altogether and three more limited it to treason or first-degree murder of a law officer. In the 1920s, however, there was a resurgence as the US went through Prohibition and then the Great Depression. Some states that had banned it, reinstated it. In the 1930s the US averaged 167 executions a year – more than any other decade of American history. In the 1940s, the US dropped to an average 129 executions a year. In the 1950s, down to 72 a year. In the 1960s, down to 19 a year. Public support for the death penalty was its lowest point ever in 1966, with only 42% of Americans supporting. When the Supreme Court ruled the capital punishment process of the time unconstitutional in 1972, there hadn’t been a single execution since 1967. Then the death penalty came back. States enacted new laws designed to overcome the court’s concerns of arbitrary imposition. After ten years without an execution, state governments began killing people again in the late 1970s – three before 1980. The numbers picked up in the 1980s: an average of 18 a year. Then through the 1990s, there was a rising tide of executions until it reached a peak of 98 executions in 1999. Since 1976, 1,423 people have been executed by their government. Fifty-five percent of them were white, 35 percent black, and 10 percent Hispanic or other. Yes, that’s disproportionate. African Americans constitute less than 13 percent of the population but 35 percent of those executed. But the greater racial bias appears when you look at the victims of the alleged murders. Only 15 percent of the murder victims in cases that resulted in an execution were black. 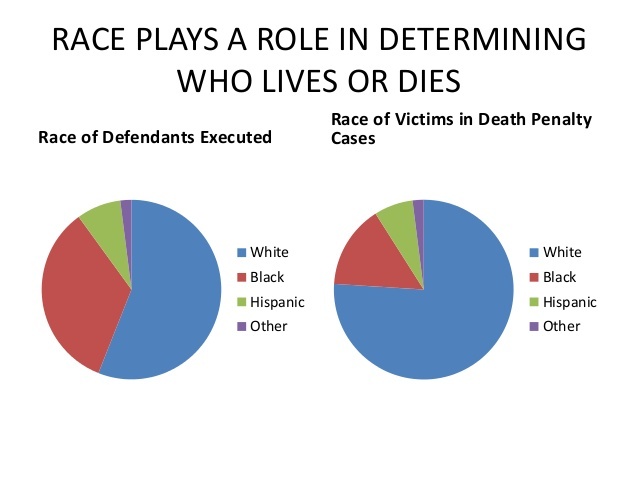 Seventy-six percent of the murder victims in cases that resulted in an execution were white – even though nationally about 50 percent of murder victims are white. White lives matter in this country: our law enforcement will go after a killer of a white person. Black lives are treated as mattering less. We have history of oppressing people of color in this country. Before the civil war millions of African Americans were enslaved here. After the civil war, many thousands of African Americans were, essentially, enslaved here. There was the sharecropping trap, for one. There was also “convict leasing.” Former slaves were convicted of some fabricated offense, and then, as imprisoned convicts, their labor could be “leased” to businesses. From the 1880s up into the 1930s regular lynching – and less regular lynching continued until 1964 – was used to subdue, oppress, and terrorize black communities. It was, in fact, domestic terrorism on a very large scale. When many of the news reports after 9/11 referred to that tragedy as the first case of US domestic terrorism, can you imagine how that sounded coming out of TV sets in African American communities? Imagine Germany with the death penalty. And then imagine that the executed were disproportionately Jewish, or that murders of non-Jewish victims were taken more seriously. Actually, I can’t. I can’t imagine that. That would be so unconscionable as to be unimaginable. Germany, with their history, can’t go there. So how is it that the US, with our history, so easily does? That’s just one piece of why it’s so important in the current context to affirm that black lives do matter. This is part 2 of 4 of "Just Mercy"